My brother Simon who was in charge of the music. Behind him L-R: Uncle Jeff and Aunty Evo from New Lynn NZ. Uncle Salu in the yellow and Uncle Lindsay and Malia looking away. 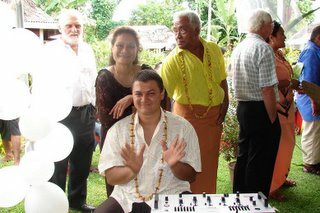 Funny story about Salu: We went to his house on the Monday two days after the wedding to take our family and friends to see the tapa making by his wife Faamuli. Salu's daughter Lea comes out of the house to say hello and points to the fale laughing and accusing us for something. I asked what it was and she laughs and said that Salu is still rolling around on the floor of the fale hungover as heck since he came from the wedding Saturday night. We thought that was hilarious. Then Faamuli added that he's been helpless and has not gotten up since. Now that's how good the day was, even Salu who hasn't drunk a drop of alcohol in awhile (aside from kava at the market) got wasted on the day and he's 76 years of age. Manuia Salu!